Rubber seal conditioner with foaming action. 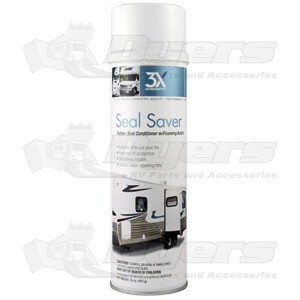 3X:Chemistry Seal Saver is a foaming rubber seal conditioner shields and conditions expensive RV slide out seals. Prolongs seal life by providing UV protection and decreasing friction during slide out extension. Leaves a light, water-repellent film compatible with all rubber seals and adjacent surfaces. Test on hidden area first. Clean seals before treatment. Hold can close to seal and quickly spray a 2"-3" bead down the length of the seal. Spread the foam evenly with a soft cloth and allow to air dry. Avoid excessive rubbing. Allow the film to remain. Leaves a light, non-staining protective coating. Extends Seal Life: Keeps seals pliable and helps prevent tearing and sticking. Fortified with lubricating PTFE. Protects & Conditions: Offers UVprotection and fights deterioration caused by road film, oxidation and the elements. Non-Staining: Easy to apply foam is non-staining and safe for adjacent surfaces. Use for window and door seals or gaskets on your RV or automobile. Seals: Leaves a water-repelling film that resists corrosion-causing moisture.